After you have created the key poses, you can animate the in-between poses yourself or let Harmony do it using motion keyframes. When you use motion keyframes, the drawings gradually move to the next position instead of staying on the spot until the next keyframe. You can create a motion keyframe in several different ways. You can have Harmony create it automatically, transform a stop-motion keyframe into a motion keyframe and even switch your preferences to have Harmony always create motion keyframes by default. In the top menu, make sure the Animation > Stop-Motion Keyframe option is disabled. ‣ Right-click on the selection and select Insert Keyframe. ‣ Click the Add Keyframe button in the Timeline toolbar. In the Camera view, if the Animate mode is enabled, as soon as you move the selected element, a keyframe will be automatically created on the current frame. In the Timeline view, select the stop-motion keyframes to convert into motion keyframes. 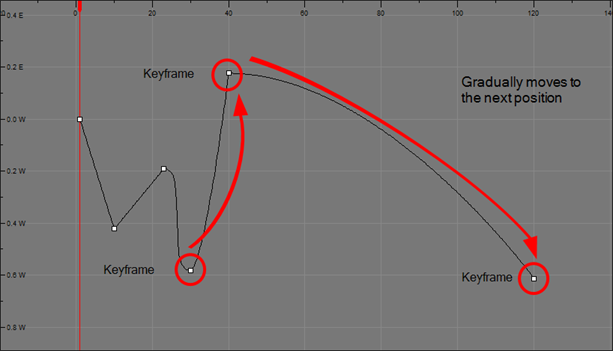 ‣ Right-click on the selection and select Set Motion Keyframe. ‣ Click the Motion Keyframe button in the Timeline View toolbar. ‣ Press Ctrl + K (Windows/Linux) or ⌘ + K (Mac OS X).